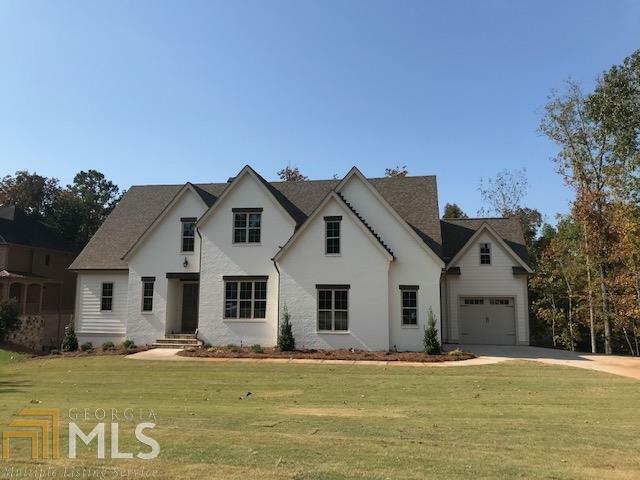 Luxurious Lake Front custom plan with basement by Simply Southern Traditional Homes. Master on main. 10&apos; ceilings throughout the main floor. Large kitchen with huge island, 36" stainless steel gas prof. range with double ovens. Vaulted covered porch with fabulous lake views. 3 car garage. Upper level has 3 large bedrooms, 2 baths and den. Energy efficient - tankless H/W & spray foam insulation. The Canoe Club amenities include: tennis, pool, 24 hour fitness center and 2 lakes for fishing, kayaking and canoeing. Directions: Take Hwy 85-S To Exit 61. Left On Hwy 74. Travel 7 Mi. Turn Left Onto Hwy 54. Continue For Approx 6.5mi. Turn Right Onto Lester Road. Turn Right Onto Waterlace Way. #157 Will Be On Your Right.